But the 30-plus hectare sanctuary is not just attracting schooling fish but frequented as well by other endearing sea creatures: the pawikans (sea turtles) such as the Hawkbills, Olive Ridleys and Green turtles. Hawkbills are one of the two critically endangered sea turtles in the world and hunted by poachers for its tortoise shell. 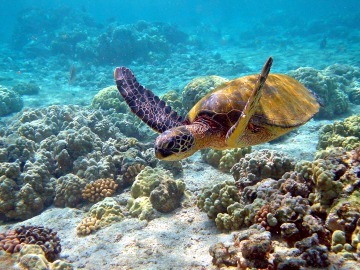 These sea turtles, females mostly, come ashore only to lay eggs. Local marine technologist Mariane Monterey said they have tagged at least 40 sea turtles last year in Stella Mariz which has shallow seawaters and typhoon-proof coves. The presence of sea turtles in the fish sanctuary bolstered local conservationists' efforts to make Stella Maris as Oriental Mindoro's 6th Marine Protected Area (MPA). MPAs, as defined by the Bureau of Fisheries and Aquatic Resources (BFAR), refer to identified portions of land and water set aside by reason of their unique physical and biological significance, managed to enhance biological diversity and protected against destructive human exploitation. Incidentally, MIMAROPA, particularly Palawan, is one of the sites where there are marine turtle sanctuaries (otherwise known as marine turtle habitats and nesting areas): the islands of Hanog, Tanobon, El Nido and Kota and Panata-Cay-Kalayaan Group. While the local government (municipal and barangay officials) prepared the ordinance and other legworks to prohibit fishing in the Stella Maris fish sanctuary, private organizations such as Conservation International and the Malampaya Foundation Incorporated (MFI) helps in capacity building to empower the locals in doing conservation. MFI is the social arm of the Malampaya Deep Water Gas to Power Project, the pioneering natural gas project operated by Shell Philippines Exploration BV (SPEX). MFI supported Barangay Calima by providing a resource assessment for Stella Mariz and through the selection, delineation, groundbreaking and base lining of the site. It also provided capacity building for the managers of the MPA and created a network of enforcement coordinators for the area. The coastal community is also benefiting from the conservation work in terms of the source of livelihood it provides for many individuals. Lynne Alcanices, Senior Fishery Officer of the Province of Oriental Mindoro, said that the practice of establishing MPAs is now widely accepted in the province, indicating increased public awareness of the urgency of sea biodiversity protection and preservation.